RBK AROMATHERAPY LLC - RBK Aromatherapy -Certified & Trained Aromatherapist in Central, New Jersey. I am a Certified, Professional &Trained Clinical Aromatherapist in Central New Jersey. I have learned the chemistry of how the individual components of the essential oils may help your body to repair itself both physically and emotionally. I only use safe and pure essential oils, lotions, carrier oils, salves and butters in my blends, and customize them especially for you. If you are looking for a safe and ethical alternative to promote wellness, then please contact me. I will work on your physical, mental, and/or emotional concerns to obtain greater health and well being. My specialty is working with Seniors and also those in Hospice. I have written many articles for several Hospice and Palliative Magazines including Aromatherapy Today, The Hospice Action Network, and National Association of Complementary Therapists in Hospice & Palliative Care in the UK. I also do telephone support if you are not living near my area or out of state. I also do workshops on "What is Aromatherapy and How To Use it Safely" and Beginner Classes. Referred to as Essential Oil therapy, can be described as an art and science of utilizing naturally extracted aromatic essences from plants to balance, harmonize and promote a health of body, mind and spirit. Essential oils have been found to provide both psychological and physical benefits when used correctly and safely. ﻿Aromatherapy can help with Anxiety, Stress, Pain Management, Allergies, Concentration & Memory, Headaches, Skin Conditions, Confidence and much more. 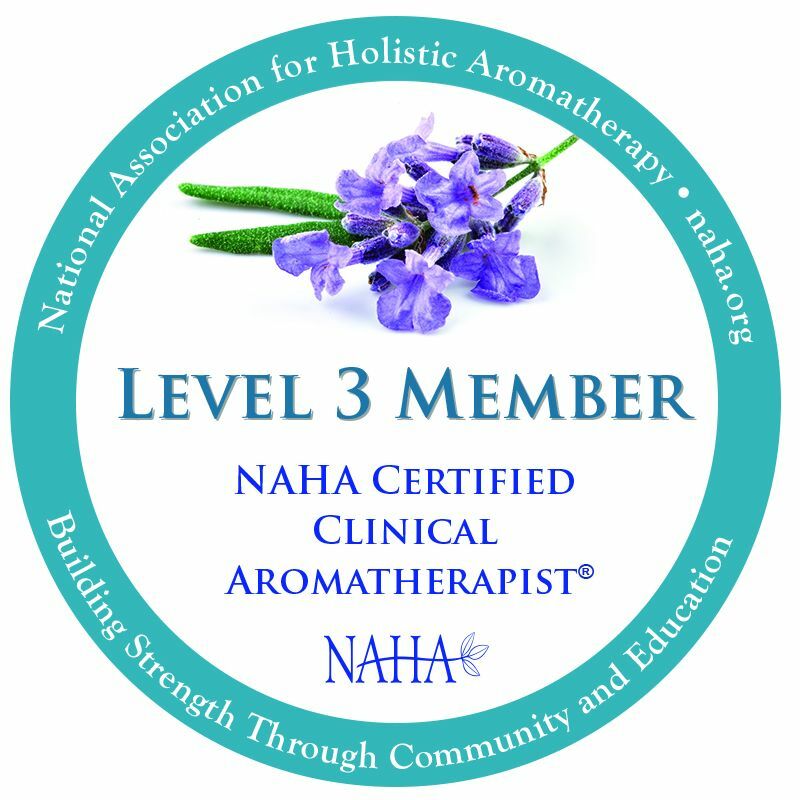 I am a Clinical Member of the NAHA (National Association of Holistic Aromatherapy) and the New Jersey Central Regional Director. This organization is leading the industry towards making aromatherapy a readily accessible and respected holistic modality. I also set up and help run a Facebook group that has over 12,000 members. This group was set up to provide members with safe recipes and responsible information ﻿“Safe Essential Oil Recipes Only!"﻿. I also run a Frankincense Resin group which teaches all about what resins are and how can one use them in their daily life. I am the Head Aromatherapy Consultant for the Stein Hospice Group in New Jersey. They promote the best possible quality of life with compassionate end-of-life care. I am the Aromatherapy Consultant for Right at Home which covers Middlesex and Monmouth Counties in NJ. They provide in home care services for seniors through custom care plans and respite care for family caregivers. Services include companionship, transportation, meal preparation and home healthcare. Please Click on the "More" tab, Click on "Contact". lets chat to see if I can help you. Please Click on the "More" Tab, Click on " Client Intake​ Form" to send me all your information. Please Click on the "More" Tab to see all about me. All the material provided here are for informational or educational purposes only. Please seek the advice of your healthcare professional or physician first.